Fine art papers at 300 gram as are most productive using them from the roll. But once you use a Hahnemuehle Photo Rag 308 gram or even an Epson Enhanced Matte paper from the roll you have to live with paper curl. The company Glastonbury Design faced this problem and developed for itself the tool now call D-Roller. We got a sample and tested it at our summit. We have to say that it does it job very well. We also like it's design, it is well made. "This D-Roller will allow you to take the curl out of fine art papers that come off a roll. These papers are used in the fine art and photography digital print market. 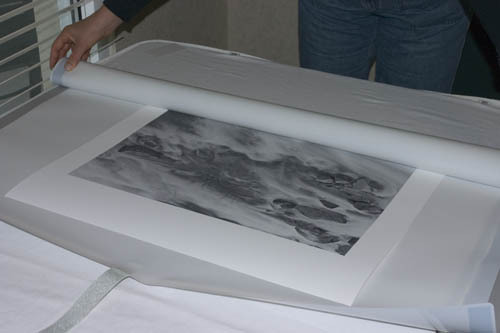 Traditional fine art papers may also be D-Rolled to take the curl (roll set) out of the paper. Papers may be D-Rolled prior to or after printing with no dry time needed for the inks. DR150 - This model works best with the vast majority of fine art papers. These include Epson, Crane, Legion, Roland, and Hahnemuehle art papers. DR200 - This model works best on soft papers and on papers in environments with high humidity levels. 2. The longer you leave the paper rolled up in the D-Roller (1-60 sec.) the more curl you will take out of the sheet. You can de-curl the paper too much and make it curl in the opposite direction.". For us a time of about 10 seconds worked just fine. We would not longer worry about using fine art papers from a roll.